Facebook offers a wealth of targeting options for advertisers to create audiences of all types and sizes. From an events perspective, the event page has been around for quite some time. However, the targeting options surrounding the event page have always been frustratingly limited. Until now. 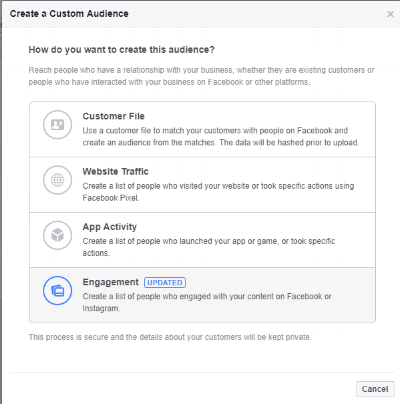 Facebook have recently rolled out custom audiences for events, the targeting options for these can be found sat with the engagement custom audiences. Engagement custom audiences provide multiple targeting options based how user engage with content such as video, lead forms, canvas, Facebook pages and Instagram business profiles. Here you can now select 'Event' and begin to create new audience groups based on how user engage with your event page. You have a couple of options in terms of how you create the audiences. You can select both those that are 'interested' and 'going' or you can separate these out. For example you may want give a nudge to those that have indicated they're interested but haven't yet purchased a ticket. Additional logic can be added to these, for example if you run regular events you could select people that have previously attended / responded to these older event posts. This is probably one of the most powerful features, in our opinion, for club nights and theatre's. Once you have your audience created you then have further options to create lookalike audiences. This could be useful for larger one off events, such as festivals, which will gather large numbers of responses in shorter time frames. If you don't currently see the 'Event' option in your engagement panel sit tight, it shouldn't be too much longer to wait. We help promoters sell more tickets through our Facebook advertising services. If you're interested in finding out how we can help you call 0117 901 2288 or send us an email hello@weselltickets.uk or get in touch with us here.